I had been looking into large domestic cat breeds after the loss of my last cat. I loved the wild look and large size as most of us do. The price was hefty but if you think about it this is a pet you may have for 20 years or better and the fact that they are rare and difficult to breed from serval to Savannah. I was only able to get my savannahs because I had recently sold my fish'n'ski boat. After having my savannahs for a few months now I think it was a good decision. 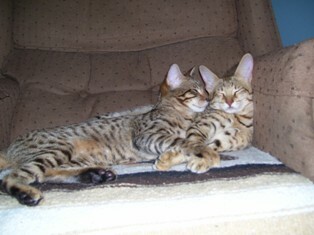 I first got Pe-Le a female F4 Savannah and a month later I realized she needed a buddy to help burn off that energy and I was wanting one with more serval blood. So I then got Ma-Zu a F2 Savannah female who I have felt lucky to get seeing as how a known breeder was also interested in her for her great serval traits. They are only a couple weeks apart here at around 6- 7 months of age. At around seven months now they weigh 6 and 10 pounds, that is for the F4 then F2. I name them after a goddess of Hawaii and one of China. They really have unique personalities. They do love to play in the shower, water or not. The F4 will fetch and return the ball or whatever to your area. They are very active, communicative, and seem loyal. I have found them waiting for me when I get home. They let you know when they want something and when they don't like something. There great pets, I'm glad I have them. Its the idea of having a rare and exotic pet that most have never heard or seen of that gets me. Thanks. Im glad you are happy with your savannahs. We were not so lucky with our purchase of an F-6 Savannah female. We did get her from a breeder. She was beautiful and we thought it would be cool to have part of the wild also. I had a lot of experience with Bengals and still have my beloved Lia who is half Bengal. OUr Savannah was extremly aggresive. She only liked the other cats. We caged her at night and when we were not at home. I wanted to make sure she was eating properly. She then became cage aggresive and we couldnt even handle her to get her out of the cage. I tried to tame her with treats and that made her even more aggresive for some reason. She would not take them from your hand and would swat and lunge to try to bite my hand. She ate them just fine off the floor. Needless to say I was very upset. Here I had this beautiful cat that I couldnt even touch. I also have a lot of animal expierience. I worked in a pet shop for 13 years, grew up on a farm and owned every type of pet from hamster to iguana. I called the breeder very upset one day when she tore my hand open when I tried to pick her up. He offered me a trade of a full sister from the last litter. Well we had no choice so we made the trade. Aurora is not as pretty as the last one but her personality is complete oppisite. Mind you shes not a lap cat and does not appreciate being handled. But we can pet her, play with her, and she lets me put the treat right into her mouth. Shes our little baby. 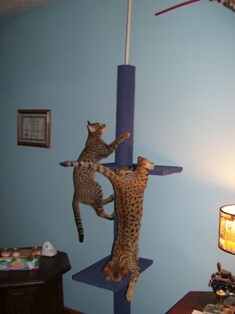 Hi, I understand how you feel about Savannah cats. You may know that I stayed with Martin and Kathrin Stucki at their farm and cattery, A1 Savannahs, near Ponca City, OK. I had lots of opportunities to play and interact with F1, F2 Savannahs They are addictive! You might have seen my photo of FOCUS, an F1 Savannah kitten. He was a darling. Alpha male type character I thought but a lovely cat in appearance and character with a different voice to your normal domestic cat. He will grow up to be an amazing F1 Savannah cat. I live in London, England and this is not the place to keep an F2 Savannah but if I lived in the wide open spaces of the USA I think I would keep a Savannah cat. They are very special. I like the names of your cats. Thanks for sharing your story.